In October I went to NZ for two weeks. While I was there, my parents and I went to Martinborough for a two day wine tour. We got extremely lucky with the weather. Prior to going to Martinborough it had been raining, cloudy and overcast every day. On the day we went to Martinborough, the sky opened up and was just a beautiful day! Martinborough is famous for their Pinot Noir, but I have to say, I didn't find one that I liked. I also didn't like the Rose in Martinborough. As one should know in the wine industry, what one person likes, is not necessarily what the next person likes. So please note, the comments I make are based on my opinion, and I do apologise if you take any offence to them. More than anything, this blog is about the wineries and the wine tasting experiences. Sure the wine is important, but I do believe the scenery, vibe, architecture of the building etc, is all very important in ones winery experience also. We started the first day at Martinborough Vineyard. Their Martinborough Vineyard Reserve Pinot Noir 1998 was ranked #1 in the "World's Top 20 Pinot Noirs" http://www.martinborough-vineyard.com/, so I was very keen to check out their wine. It was a cute little place, we received good service and had a pleasant tasting. As you can see in the photo below, there are some outdoor tables and chairs. It would have been so nice to do a tasting out there!! In Martinborough, there are very few wineries that offer a tasting outside. It is usually done at the wine tasting counter/bar inside the tasting room. The tasting room was quite nice, there is no where to sit down, so you do the tasting standing up. Having spent the last year in South Africa visiting many wineries where you sit for a tasting, I found this quite funny. We tried the Martinborough Vineyard Pinot Noir Rose 2011 (NZ$20), it tasted of strawberries, but it was a bit bland, dry, and had a bitter aftertaste. The Martinborough Vineyard Manu (medium) Riesling 2011 (NZ$28) was rounded, slightly sweet, balanced, had an interesting fruity flavour and hints of honey. The Martinborough Vineyard Chardonay 2009 (NZ$40) was oaked, balanced, had a nice fruity taste, and hints of apricot. The Martinborough Vineyard Pinot Noir 2009 (NZ$70) was light, balanced, yet dry. I found it lacked a bit of flavour. Also for tasting was the Burnt Spur Range. We tried the Burnt Spur Sauvigon Blanc 2011 (NZ$16) this had a nice fruity flavour, was nicely balanced, creamy and soft, and had a fruity lingering aftertaste. The Burnt Spur Pinot Gris 2010 (NZ$22) was quite sweet (like a Gewuurztraminer), smooth, had a strong fruity flavour (peach) initially. Last of all was the Burnt Spur Piot Noir 2010 (NZ$39) which was burnt tasting, dry, and not so nice (in my opinion). Overall, it is a nice place to stop for a wine tasting. Next we went to Alana Estate. This is just down the road from Martinborough Vineyard and is very nice!! I had booked us a table for lunch here, so we first had ourselves a wine tasting before sitting at our table. The Rugby World Cup was still on in NZ at the time, so a lot of places had flags up to support the All Blacks team!! This photo was taken as we were driving up to Alana Estate. The lady in the tasting room was very friendly and provided us with good service. The Toast 2011 Martinborough event was to be held in November, which is why the banners were hung up all over the wineries in Martinborough. From the sounds of it, the festival is very much like Wacky Wine Weekend in Robertson. If you are going to NZ in November, be sure to check out the date of this event!! We started our tasting with the Riesling 2009 (NZ$35), this was smooth, fruity yet had a dry aftertaste. Next we had the Sauvignon Blanc 2010 (NZ$27) which had a beautiful fruity flavour, slight grassy tones, yet great tropical flavours and smell. It was not acidic. It was just lovely!! The Chardonnay 2010 (NZ$42) was very nice!!! I was told that this wine was half oaked and half kept in steel barrels. It was very balanced, had honey tones, was creamy, elegant and stunning!! Definitely a favourite of mine. I would have liked to have bought a bottle but I felt R280 for a bottle of Chardonnay was a bit steep. Worth the money if you have it though!!! We also tried the Rapture Pinot Noir 2010 (NZ$45) this was light (in body), had great flavour, and slightly dry aftertaste. The Pinot Noir 2009 (NZ$60) was light and had a very slight spicy character to it. We sat down for lunch at a table outside in the sun. It was such a nice day, so we wanted to make the most of it. Umbrellas were available and so was sunscreen, so they were fully equipped and prepared. Our lunch was amazing!!! The service was just fantastic, the menu is lovely and the food was great!! We ordered a bottle of the Sauigon Blanc, this went down very nicely!! To start with we had these Mushroom Arancini Balls for an entree. It is usually sold as a salad for a main, but the chef was kind enough to let us have a tasting for an entree. We also had the Arawata Whitebait patties w sourdough & local lemons main $36 as an entree to share. For our main, my father and I both had the Ocean Salmon w sauteed potato's & green beans w Salsa Verde$28 . This was very nice. I cannot remember what my mum had, but if I remember correctly, she didn't like hers as much as ours. This ended up being a definite highlight of the trip. We had a great experience and I would definitely recommend one visits this place when in Martinborough. Our third winery for the day was Coney Wines. My parents recommended this place as they are a fan of Coney wine and always have some in stock, they also recommended this place because the winemaker is very friendly, funny and talkative. We had to drive to the other side of town to get there, and it took not even 10 minutes. I loved that!! This is the gentleman my parents were talking about. Sure enough, he was so welcoming, friendly, funny and talkative. It made for a fantastic wine tasting experience and it was a lot of fun!! I think it's great that the winemaker is in the tasting room to do the tasting with you also, it's a bonus!!! As for the wine, it was very nice. We tried the Rallentando Reisling 2009 (NZ$23). It was sharp, and had a lime lingering aftertaste. I thoroughly enjoyed the Ragtime Riesling 2010 (NZ$23), this was sweet and very similar to a Gewuurztraminer. I also liked the Ritz Reisling 2010 (NZ$23), this was very nice!! It was slightly sweet, balanced and had lovely flavour!! The Piccolo Piot Gris 2011 had an interesting taste on the palate and a completely different aftertaste. It was very fruity yet non-descriptive. The Ramblin Rose 2011 (NZ$24) is made from Pinot Noir. It had a strawberry taste to it, interesting characteristic and moist aftertaste. The Pinot Noir 2009 (NZ$34) I felt was a little sour and spicy. My favourite was the Que Sera Syrah 2008 (NZ$34). This had a strong smell, had hints of tobacco, was spicy, balanced, smooth and I also got hints of pepper. I really liked it. My parents bought a bottle for me to take back to SA for my boyfriend to try. We enjoyed it while at a river lodge in Swellendam. We both really enjoyed drinking this wine. They have a beautiful outdoor patio with a retractable roof. Here you can enjoy a meal and a glass of wine whether its rain or shine. You can check out their sample menu on http://www.coneywines.co.nz/cafe/menu/. 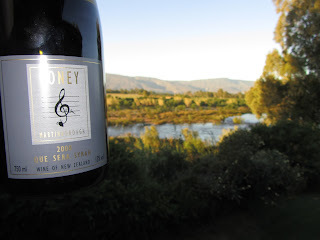 We had a fantastic experience here at Coney Wines and I highly recommend you visit this winery when in Martinborough. I am sure you will have just as much fun trying the wines with Mr Coney as we did. He truly has great passion for wine and really makes the tasting so interesting. Next we visited Murdoch James Estate. The tasting room was nice; there was plenty of space, and there is a nice outdoor decking and restaurant. The guy who served us here was very nice, welcoming and friendly. We were the only ones there, so that was a bonus. We started the tasting with the Blue Rock Trafalgar 2009 (NZ$20) which is a late harvest Riesling and Sauvignon Blanc. This was sweet, balanced, and had a slight taste of raisins. Next we tried the Blue Rock Pinot Gris 2010 (NZ$25) which was mineral like, had pear flavour, slight lime taste and was a little spicy. The Blue Rock SB 2010 (NZ$20) also had a mineral taste to it and had hints of lime. The single vineyard Pinot Noir 2010 (NZ$39) had spicy tones, tobacco, plum, and a dry lingering aftertaste. The Cabernet Sauvigon/Cabernet Franc was a 20/80 blend. It had spicy, blackberry and pepper tones. The fortified Pinot Noir 2006 (NZ$65) was barrel-aged for three years. It is 18% alcohol. After the tasting, we were taken for a tour of the cellar which was very nice. He showed us where some of the bottled wine is stored, and told us that they open a bottle of the previous vintage to test the new vintage for consistency. As they have a nice decking and a restaurant on the premises, this may also be a nice option for a lunch stop on your day of touring the wineries. We started our second day at Te Kairanga. There was only one other couple there when we arrived, so I asked if we could enjoy the tasting outside on the patio, and the lady in the tasting room was absolutely fine with that. The other couple ended up joining us outside also, so it all worked out well for everybody. We started with the estate range, each one costing NZ$21 a bottle. First we tried the Martinborough Sauvignon Blanc 2010. This was very nice. It had a beautiful tropical fruit smell with hints of vanilla and apple. It had a lovely soft texture on the palate (like canned peaches), and had quite a zesty aftertaste. Next we tried the Estate Riesling 2010, this had a beautiful smell, had quite a zesty citrus flavour and zesty aftertaste. The Martinborough Chardonnay 2009 had a honey smell, was smooth, yet fruity and sharp. The Estate Pinot Noir 2009 had a nice plum smell, little spicy taste, little dry but was nice on the palate. This had a lot more body than the Pinot Noirs we had tried on day one. We also tried the Runholder Chardonnay 2008 (NZ$29) this had an amazing fruit smell, honey taste, hints of butterscotch and a zesty aftertaste. Overall, we had a very nice wine tasting experience here. The service was good, the wines were nice, and the setting is nice. We later found out that they offer cheese platters, so be sure to ask for one when you come here. I just had a look online and see they have an on-site deli. Check out the website for more info:﻿ http://www.tkwine.co.nz/Cellar_Door_11.aspx. It also says that you can bring your own picnic and enjoy it on the premises. Sounds like a plan for next time!! Be sure to put this winery on your list when visiting Martinborough. After lunch (in town), we stopped at the Martinborough Wine Centre. We looked at all the wine for sale, and I asked the sales assistant if NZ has the equivalent to South Africas Methodé Cap Classique. Thats when he showed me the Methodé Traditionale. I saw it was around NZ$40 a bottle, and as much as I wanted to try it, I thought it was a bit expensive. Especially as the Moet I bought in Duty free the week before was only an extra NZ$20 in price. Why pay NZ$40 for a Methodé Traditionale when you can have Champagne for an extra NZ$20? We walked out not buying anything, and I said to my parents, I really wanted to try that Methodé Traditionale. So we turned around and went back in to the store. I asked the sales assistant, which of the two for sale was the sweeter one. He suggested the La Michelle 2008. So we bought it. The sales assistant (Alex) was very friendly, and funny. He seemed to know the wine in the store very well, so I do recommend visiting this store if you want some advice on which wine to take home as a gift or for yourself. There are tastings available at the shop also, but it varies daily. Alex: I promised I would give you feedback on what I thought of the La Michelle. It was lovely!! Thanks so much for the suggestion!! I will definitely be buying another bottle of that when back in NZ!! I read somewhere that this winery was not one to be missed if you come to Martinborough. So we made sure we came here also. We tried the Rose 2011 (NZ$18). Then the Sauvignon Blanc 2010 (NZ$24) which was nice on the palate, yet had a dry aftertaste. It ws very fruity and had a nice smell. The Pinot Gris 2011 (NZ$28) was slightly sweet, had a dry aftertaste and nice fruity flavours. The Chardonnay 2009 (NZ$38) was smooth, had peach flavour, and a dry aftertaste. The Crimson Pinot Noir 2010 (NZ$35) has structure, yet lacks body and flavour. The Pinot Noir 2010 (NZ$65) the taste was bitter, and I was not a fan of this wine. Last of all we tried the Celebre 2008 (NZ$32) which was a blend of Merlot, Syrah and Cabernet Sauvignon. We weren't so impressed with the wine here. Other than the charming tasting room, I probably wouldn't recommend this place if time is limited. This is a cute little winery, the tasting room is very small, but you get a fantastic tasting with the winemaker himself. He has a lot of old empty wine bottles on display in his tasting room, which my parents were familiar with some of them, and enjoyed looking at them. The wine here is very nice, but it is pricey!! The Sauvignon Blanc 2010 (NZ$25) has honey and citrus tones. The Rose Pinot Noir 2010 (NZ$25) had 4-5 hours skin contact, was smooth, balanced, but had a slight acidic aftertaste. The Pinot Noir 2009 (NZ$60) had a beautiful flavour and was nicely balanced. The Syrah 2008 (NZ$65) was a favourite of mine, I loved it!! It had a tobacco, spicy smell, and beautiful flavour!! He said this can age for another 9-15 years. We bought a bottle of this wine, and will now wait till we are all together again to enjoy it.﻿ The Cabernet Sauvignon/Merlot 2006 had great flavour, slight tobacco and cassia flavour, with a dry lingering aftertaste. The winemaker who went through the tasting with us was very friendly, very welcoming, very informative, and definitely made this winery one worth visiting. Be sure to visit this winery!! Johner:Our last stop for the day was at Johner, which was on our way out of Martinborough, heading back to Palmerston North. I was so glad we stopped here as we had a really enjoyable tasting, and loved the wine!! It's quite a drive off the main road to get there, but its worth the detour!! There was another couple there when we arrived, and they were very chatty and we ended up sitting at the wine counter to enjoy the tasting with them and the lady serving. The lady was such a sweetie, and funny too. She is older than your average wine tasting assistant, but she was great to do the tasting with. If you ask her anything technical, she will tell you she wouldn't have a clue. She is very honest and not concerned at all that she can't answer your questions, so that was very funny, and added to the charm of this place. We started with the Methodé Traditionale Chardonnay/Sauvignon Blanc 2009 (NZ$40). This is the equivalent of the South African Methodé Cap Classique!! It had nice flavour, was light, playful, not dry, not sweet, very nice. The Gladstone Single Vineyard Sauvignon Blanc 2011 ($18) has a beautiful tropical fruit flavour, it's gentle, easy drinking and smooth. The Wairapa Pinot Gris 2011 (NZ$22) had hints of honey and nectar, was smooth and had a very slightly dry aftertaste. The Wairapa Chardonnay 2011 (NZ$24) was creamy, smooth, had a light fruity flavour, and was lightly oaked. They had a Pinot Noir Rosé for NZ$18. The Riesling 2011 (NZ$22) was sweet, light and nice. The Moonlight Pinot Noir 2009 (NZ$22) was light, lacked body and flavour. The Pinor Noir 2009 Reserve (NZ$50) was rather sharp and dry. The Cabernet, Merlot, Malbec (NZ$40) had interesting flavours, and a little metalic tasting. The Cabernet/Merlot 2009 (NZ$50) I didn't like. The Noble Sauvignon Blanc 2009 (NZ$22) was lovely. It was not sickly sweet, just perfect!! The Noble Pinot Noir 2009 (NZ$22) was delicious!! It was more sticky than the last dessert wine, but still fabulous. The couple beside us were a few wines ahead of us, and they kept saying that the next dessert wine was even better than the last, and we experienced the same thing. We went on to try the Riesling 2011 (NZ$22) which was nice, had a fruity flavour, was lighter than the last desssert wine and not as syrupy. We really liked this one. The Syrah 2011 (NZ$22) was just wow!! It was very nice. It had beautiful flavour!!! Last of all we tried the Cabernet Sauvignon 2011, this was ok.
We walked away with a 12 bottle case of wine. There was a special that if you buy 6 or more bottles you would get 30% off, was a bargain!!! I think we walked away with 6 dessert wines and 6 other wines. I can't wait to go back to NZ and drink those bottles!! hehe. My friend and I finished at Glen Carlou for lunch after visiting Warwick and Le Bonheur. I just love the building at this winery and the view!! We booked a table outside, so that we could soak up the view while enjoying our lunch. Seeing as it had been quite a while back that I last did a tasting at Glen Carlou (and it was one of the first wineries in the Western Cape I visited) I decided to do a wine tasting again. My friend had never been here before, so she also did a tasting. I was so glad I did the tasting, because my opinion on Glen Carlou's wine is now very different. It costs R25 to try five wines from the classic range. They charge R35 for the prestige/classic range tasting. For this tasting you get to try the three prestige wines and 2 of the classic range wines. They also have an international wine tasting which costs R50 and includes trying a wine from Australia (Peter Lehman wine), Argentina and California. You also get to try two wines from the classic range. For all tastings the fee is not waived if you buy a bottle or two of wine. However, there is a 10% discount on purchases of 6 bottles or more. I loved the fact we were able to do the tasting at the table while waiting for our food. I tried the Quartz Stone Chardonnay 2009 (R275), this had strong flavours, was creamy and smooth. "The Welder" Natural Sweet 2009 (R89) was fantastic!! It was beautiful, sweet, smooth and stunning! I liked the Chardonnay 2010 from the classic range (R90), this was very nice. The Syrah 2007 (R120) also from the classic range, was smooth, a little spicy (like tobacco) and easy drinking. From the limited edition I tried the Methode Cap Classique (MCC - this is sparkling wine but it is made using the same method as Champagne) Brut Reserve 2006 (R178). This is made with Chardonnay/Pinot Noir grapes, it is dry but still pleasant. The unwooded Chardonnay 2011 (R78) was nice, easy drinking, fruity and balanced. Last of all I tried the Tortoise Hill White 2011 (R42) from the contemporary range. This is a blend of Viognier, Verdelho and Semillon. It was an easy drinking wine. We ordered a bottle of the Sauvigon Blanc to have with lunch, and it was just lovely. It went very nicely with our food and was a very pleasant wine to drink. Even after visiting three wineries this wine went down so easily and was full of flavour. I ordered two entrees and a dessert for lunch. I had the Asian glazed roasted Duck, Granny Smith apple and hoisin dressing for R65 and the “Waldorf” Salad with red wine poached pears, fresh apple, celery agar agar, toasted walnuts and a blue cheese dressing. Both these were very nice!!! The menu appeared to be different from when I last visited, but it was still a nice menu and suitable for the season. My friend ordered this chocolate fondant, fried banana and caramel ice cream dessert, and it was delicious!!! Definitely order this when you dine at Glen Carlou!! You can view the menu on http://www.glencarlou.co.za/restaurant_menu.html. I highly recommend one visits this winery if out this way, and make this your stop for lunch! This is a nice winery. There is a lovely grass area and children’s playground outside. The tasting room is nicely sized and welcoming on the inside. There is an outdoor patio just outside the tasting room with tables and chairs where you are also welcome to do your wine tasting. From this patio you look out on to a pond with plenty of lawn surrounding it where you can enjoy a gourmet picnic. They have set up the lawn with bean bags, picnic blankets and umbrellas. At this winery they have 6 wines for tasting. These include the Professor Black Sauvignon Blanc 2010 (R95), Chardonnay 2010 (R135), The First Lady Cabernet Sauvignon 2009 (R60), ‘Old Bush Vines’ Pinotage 2009 (R95), Three Cape Ladies 2009 (R115) Trilogy 2008 (R250). They have other wines for sale but not for tasting. I thought the Professor Black Sauvignon Blanc 2010 was very fruity with a nice lime flavour to it, it’s also very smooth. The Chardonnay was creamy, nice and didn’t have a wooded/oaked taste to it. My friend usually doesn’t try Chardonnay’s let alone drink them, but she also felt this was a really nice Chardonnay and one that she would actually enjoy drinking a bottle of. The First Lady Cabernet Sauvignon was a little spicy, dry and had hints of tobacco. ‘Old Bush Vines’ Pinotage had great fruity flavours but a chalky aftertaste. The Three Cape Ladies is a blend of Pinotage, Shiraz and Cab Sauv. This wine is elegant, yet has a slightly chalky aftertaste, and has dark chocolate and pepper tones. Our experience here was really nice. I would love to get our group of friends together one day and enjoy a picnic on the lawn, it would be a really nice way to spend a nice sunny afternoon!! A few weeks ago on Saturday the 1st of October I went to Middlevlei for a TSIBA charity running event. Sure I didn’t run, but I still contributed to the charity and walked the course. I unfortunately didn't have my camera on the day so don't have any photos of the winery. I have used some of the photos from the Middelvlei website. You can check out more photos on http://www.middelvlei.co.za. Each month, the event is held at a different winery. You turn up at the chosen winery about 7am as the run starts about 7.30am. As this is on a Saturday, you will need a slightly early night on Friday. It costs R60 to attend this event. The run at Middlevlei was 6.5km or you could do it twice and run 13km. As our friend is a running buff, he did the 13km and we walked the 6.5km and it worked out perfect as we crossed the finish line at the same time. What a way to start the day and we helped raise money for a good cause!! Once you finish your run or walk, you get to have a free wine tasting in the tasting room. The tasting room reminds me of a cabin you would see when hiking/camping in NZ, so it has a rugged feeling to it, but in a nice way. There is a lovely fireplace in the room which you can sit around. There were wooden tables inside and outside. A tasting normally costs R15 at Middlevlei. I have to say I thoroughly enjoyed the Chardonnay 2011 at this winery. It is smooth, easy drinking, not wooded and nicely balanced. It sells for R54 a bottle so I bought two bottles, which I look forward to opening in the next month or two. The other wine I liked was the Free Run Pinotage 2010. It sells for R87, is slightly dry and has a great fruity flavour. They also have a Pinotage/Merlot 2009 for R65 and a Shiraz 2009 for R96. The service at this winery was fantastic, and even though it was really busy, the lady working there still made the effort to tell me information about the wine. At Middlevlei they also had a Braai going where we could order Boerwors or Braaibroodjies. They were delicious!!! Some of the best Braaibroodjies I have tried in South Africa. For those who don't know what a Braaibroodjie is, it's a toasted sandwich done on the Braai. It is so much better than a toasted sandwich though!! They are usually filled with onion, tomato and cheese. After we had all rested, done a wine tasting and had some food, there was a prize giving. There were prizes handed out for 1st, 2nd and 3rd placed winners, and then many prizes for spot prizes. This is a nice wine farm to visit and worth checking out. I also recommend attending this charity event, as it's a nice way to start the day, you get to visit a new wine farm every month and you get to do a tasting.